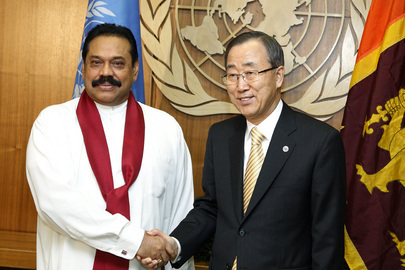 UNITED NATIONS, February 9 -- Sri Lanka was raised in UN Secretary General Ban Ki-moon's closed door briefing to the Security Council on Monday, UK Ambassador John Sawers confirmed to the Press after the meeting. A member of Ban's staff, speaking on background, told Inner City Press that Ban relayed to the Council Sri Lanka's President Mahinda Rajapaksa's strident response to Ban's inquiry about civilian casualties: "what civilian casualties"? He predicted that the momentum among Council members for a briefing on Sri Lanka will result in a closed-door session, perhaps without the Secretariat's involvement. The issues, as the UN Secretariat for now says it sees it, are to protect the civilians in the remaining Tamil Tiger territory, to help them leave the zone of conflict. They are held there, according to the Secretariat, by "fear, force and family." Some are family members of the Tamil Tigers, and stay for that reason. The Tigers force some to stay, the Secretariat says. But, the UN now says, there is a concern about the camps the government has set up for civilians who leave the Tamil Tiger zone. Some call them detention centers; there is talk of intimidation and recruitment of informants. The UN, the source tells Inner City Press, is thinking of suggesting international monitoring of the camps. When Monday's session finally ended, the Council President Ambassador Yukio Takasu confirmed on camera that Ban described the call he made from New Delhi to Sri Lanka's president. When asked to elaborate by Inner City Press, Amb. Takasu referred to his response earlier in the day, about his mediation between two countries -- Mexico and Russia -- about the Council getting a briefing on Sri Lanka, reported here. The spokesperson of one Permanent Five Council member later on Monday told Inner City Press that Russia's opposition to Mexico's request for a briefing was "procedural," that the item shouldn't be discussed at that time. We'll see -- watch this site.